Savvy Spending: DaySpring: B1G1 free Inspirational Mugs and Tumblers, plus $20 off $60 and 13% cash back! 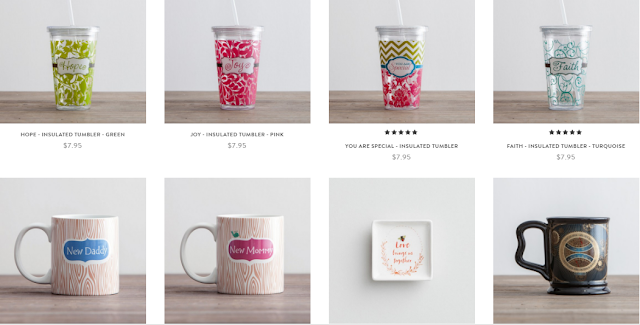 Tumblers for $1.50 shipped! DaySpring: B1G1 free Inspirational Mugs and Tumblers, plus $20 off $60 and 13% cash back! Tumblers for $1.50 shipped! Through Wednesday, 10/12 only, DaySpring.com is offering Buy 1 Get 1 Free ALL Inspirational Mugs and Tumblers! No promo code required. Plus you can save $20 off your $60 purchase (before discounts) with promo code FALL20 at checkout. Get FREE shipping on a $50 order and get a whopping 13% cash back from Top Cash Back! Just be sure to log into or create your DaySpring account first. And to get the Cash Back from Top Cash Back, be sure to go here and type in DaySpring and then "get cash back now". If you add 8 tumblers or mugs to your cart and use code FALL20 and get the B1G1 Free promotion, you'll end up paying about $12 for all EIGHT of them shipped! That makes them each only about $1.50 each! And if you start at Top Cash Back, you'll get $1.50 back in your account! Stock up for baby showers, Christmas gifts, housewarming present, a gift for a teacher or babysitting, party favors, and more! !